3⁄8" diameter cartridge heaters can be sleeved to fit ½" and 5⁄8" diameter holes, allowing one diameter to fit most applications. ¾" I.D. sleeves permit installation of OMEGALUX™ CIR hi-watt density heaters in 1¼" diameter holes to replace old-style large diameter heaters. Makes removal of heaters easier— no more drilling, hammering, etc. Made of steel, these pressed powder metal sleeves have been designed and fully tested to assure proper transfer of heat from the cartridge heater to the work. 800°F maximum work temperature. For higher work temperatures, contact OMEGALUX. Laboratory tests have demonstrated that in high temperature applications, improved heat transfer can lower the internal wire temperature to provide up to 100% improvement in heater life. OMEGALUX HTRC is recommended for use in the above applications where sheath temperature of the heater is expected to exceed 750°F(398°C). HTRC has an excellent transfer coefficient approaching that of aluminum. Maximum Use Temperature: 1800°F (982°C). Shelf Life: Greater than one year. HTRC Heat transfer and release coating, 4FL. oz. Edison screw base installs in standard lamp socket for simple installation— to prevent moisture accumulation, mildew, freezing— in clothes lockers, fire extinguisher, cabinets, and control boxes. Also used in resistor banks. 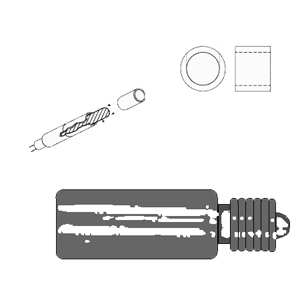 cartridge heater sleeve, ID 3/8", OD 0.498, length 1"
cartridge heater sleeve, ID 3/8", OD 0.622, length 1"
cartridge heater sleeve, ID 3/4", OD 1 1/4", length 1"
Heat transfer and release coating, 4FL. oz.